Known as the “Immortal Health Elixir” by the Chinese and originating in the Far East around 2,000 years ago, kombucha is a beverage with tremendous health benefits. The sugar-tea solution is fermented by bacteria and yeast commonly known as a“SCOBY” (symbiotic colony of bacteria and yeast). Although it’s usually made with black tea, kombucha can also be made with green tea too. You can make kombucha yourself at home or buy it for $3–$5 a bottle at most health food stores and some coffee shops. Ultimately, this cocktail of good bacteria interact together in a unique way to produce some unbelievable health benefits for those who drink it. It is shown that [kombucha] can efficiently act in health preservation and recovery due to four main properties: detoxification, anti-oxidation, energizing potencies, and promotion of boosting immunity. We agree! In fact, according to research there are five main health benefits of kombucha. The detoxifying capacity of kombucha is immense. A perfect example is in its ability to counteract liver cell toxicity. Naturally, the antioxidant prowess of this ancient tea counteracts free radicals that create mayhem in the digestive system. However, the greatest reason kombucha supports digestion is because of its high levels of beneficial acid, probiotics and enzymes. Some research has shown kombucha’s ability to prevent and heal leaky gut and stomach ulcers. No surprise to us, in some instances it’s even proven to be as effective as drugs like Prilosec, which are commonly prescribed for heartburn, GERD and ulcers. Kombucha can also help heal candida yeast from overpopulating within the gut because it helps restore balance to the digestive system. Kombucha is a great way to fight candida because it contains live probiotic cultures that help the gut to repopulate with good bacteria while crowding out the candida yeast. Kombucha does have bacteria, but these are not harmful pathogen bacteria, instead they are the beneficial kind (called “apathogens”) that compete with “bad” pathogen bacteria in the gut and digestive tract. One thing to mention here is that candida or other digestive problems can sometimes be complicated issues to fix and symptoms might actually get worse before getting better. This doesn’t mean that kombucha isn’t effective or is exacerbating the problem, just that gut problems aren’t always a straight path to healing and at times some patience or trial and error is needed. Kombucha’s ability to invigorate people is credited to the formation of iron that is released from the black tea during the fermentation process. It also contains some caffeine (although in very small amounts) and b-vitamins, which can energize the body. Through a special process known as chelation, the iron released helps boost blood hemoglobin, improving oxygen supply to tissues and stimulating the energy-producing process at the cellular level. In other words, by helping the body create more energy (ATP), the ancient tea can help those who regularly drink it stay energized. The overall effect that kombucha has to modulate the immune system is best seen in its ability to control free radicals through antioxidant measures. Clinically proven to decrease oxidative stress and related immuno-suppression, a powerful antioxidant known as D-saccharic acid-1, 4-lactone (DSL) was discovered during the kombucha fermentation process that’s not found in black tea alone. Scientists suspect that DSL and the vitamin C present in kombucha are its main secrets in protecting against cell damage, inflammatory diseases, tumors and overall depression of the immune system. Also, we know the probiotics found in kombucha support the immune system. Kombucha can help heal, repair and prevent joint damage in a number of ways. Kombucha is loaded with glucosamines, which increase synovial hyaluronic acid production. This supports the preservation of collagen and prevents arthritic pain. In the same way it supports joint collagen, it also supports collagen of the entire body and reduces the appearance of wrinkles on the skin. 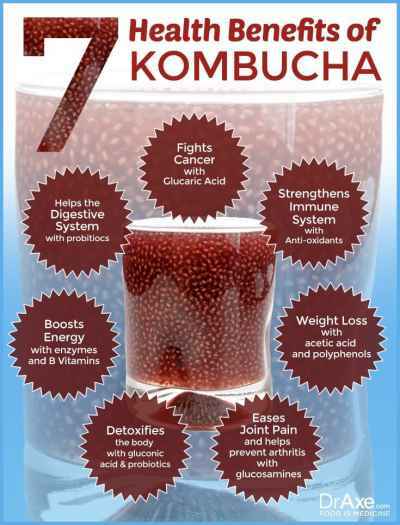 Kombucha is also beneficial for cancer prevention and recovery. A study published in Cancer Letters found that consuming glucaric acid found in kombucha reduced the risk of cancer in humans. President Reagan even reportedly drank kombucha daily as part of his regimen to battle stomach cancer. Data from a study in 2005 showed evidence that kombucha improves metabolism and limits fat accumulation. Though we need to see more studies before we can confirm these results, it makes sense that kombucha supports weight loss since it’s high in acetic acid (just like apple cider vinegar is) and polyphenols, which are proven to help increase weight loss. Kombucha is simple to make yourself, and because it can be a bit costly to buy bottled kombucha almost every day, we recommend you give it a shot. 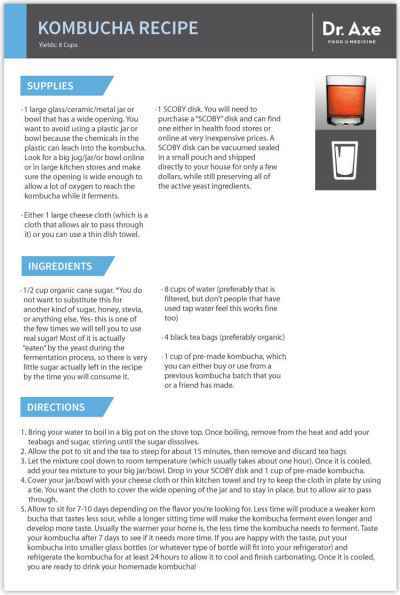 Here is a simple recipe for making your own kombucha at home. This recipe makes about eight cups of kombucha, but you can also double the recipe to make more and you still only need one SCOBY disk. 1 large glass/metal jar or bowl that has a wide opening. You want to avoid using a plastic jar or bowl because the chemicals in the plastic can leach into the kombucha during the fermentation period. It’s also possible that ceramic pots might cause lead to leach into the kombucha once the acid comes into contact with the ceramic glaze. Look for a big metal or glass jug/jar/bowl online or in large kitchen stores, and make sure the opening is wide enough to allow a lot of oxygen to reach the kombucha while it ferments. 1 large piece of cloth or dish towel to secure around the opening of the jar with a rubber band. It’s not recommended to use a cheese cloth since this allows particles to pass through. You can even try using an old thin cotton t-shirt or some simple cotton fabric from any textile store. 1 SCOBY disk. You will need to purchase a “SCOBY” disk and can find one either in health food stores or online at very inexpensive prices. A SCOBY disk can be vacuumed-sealed in a small pouch and shipped directly to your house for only a few dollars, while still preserving all of the active yeast ingredients. 8 cups of water (preferably filtered, but people who use tap water feel this works fine too). Some prefer using distilled water which will contain less contaminants or metals than tap water will. Distilled water is inexpensive (only like 88 cents a gallon) and can be found at most large drug or convenience stores. 1/2 cup organic cane sugar or honey. When it comes to sugar substitutions, some feel that it’s not a good idea to substitute cane sugar for another kind of sugar, honey,stevia or anything else. On the other hand some people have reported making kombucha successfully with raw honey. The quality of the sugar is important in order to avoid contaminants, so look for organic sugar. Yes, this is one of the few times we’ll tell you to use real sugar! Most of it is actually “eaten” by the yeast during the fermentation process, so there is very little sugar actually left in the recipe by the time you consume it. 4 black tea bags (preferably organic which some people have reported works better). Some people also like to use green tea, although black tea is the kind used traditionally in most cases. 1 cup of pre-made kombucha, which you can either buy or use from a previous kombucha batch that you or a friend made. 1. Bring your water to boil in a big pot on the stovetop. Once boiling, remove from the heat and add your teabags and sugar, stirring until the sugar dissolves. 2. Allow the pot to sit and the tea to steep for about 15 minutes, then remove and discard tea bags. 3. Let the mixture cool down to room temperature (which usually takes about one hour). Once it’s cooled, add your tea mixture to your big jar/bowl. Drop in your SCOBY disk and 1 cup of pre-made kombucha. 4. Cover your jar/bowl with your cloth or thin kitchen towel, and try to keep the cloth in plate by using a rubber hand or some sort of tie. You want the cloth to cover the wide opening of the jar and stay in place, but be thin enough to allow air to pass through. 5. Allow the kombucha to sit for 7–10 days depending on the flavor you’re looking for. Less time produces a weaker kombucha that tastes less sour, while a longer sitting time makes the kombucha ferment even longer and develop more taste. Some people have reported fermenting kombucha for up to a month with great results, so taste test the batch every couple of days to see if its reached the right taste and level of carbonation you’re looking for. Usually, the warmer your home is, the less time the kombucha needs to ferment. Once you’re happy with the taste, put your kombucha into smaller glass bottles (or whatever type of bottle fits in your refrigerator), and refrigerate the kombucha for at least 24 hours to allow it to cool and finish carbonating. Once it’s cooled, you are ready to drink your homemade kombucha! *Note that as the fermentation process happens, you will notice that the SCOBY disk “grows” a second SCOBY disk. Many people call the SCOBY that you purchased and used to make the kombucha the “mother” SCOBY and the second SCOBY that grows the “baby.” The mother SCOBY is located on top of the baby. You can actually use the newly formed baby SCOBY to create a whole new batch of kombucha, so you don’t want to throw out the baby disk. 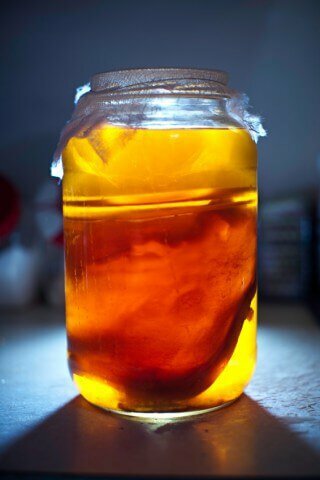 Store the baby SCOBY in a bit of already-made kombucha in a glass jar while not using it, so you have it on hand to start a new batch when you want it. It will “active” for several weeks when it’s stored in some kombucha at room temperature on a counter top. While some people prefer to keep the mother scoby disk attached to the baby, others prefer to throw away the mother SCOBY once the kombucha is finished fermenting. It seems to work well both ways and keeping the mother disk hasn’t caused any reported problems or contamination. According to some sources, the mother disk can keep fermenting new kombucha batches for about another month after its first use, but then will become inactive and should be thrown away. The recipe above is for a basic, unflavored kombucha. You can try adding unique flavors like fresh-squeezed lemon or lime juice; ginger root “juice” made by blending ginger and water, blended berries, fresh-squeezed orange, pomegranate or cranberry juices; or many other natural and low-sugar flavors. We recommend doing this after the kombucha has fermented and is ready to drink, although some people to prefer to add flavor-enhancers to the kombucha a day or two before it’s done so the flavor can intensify. Either way to seems to work well, but keep in mind that berries and other perishable fruits will not last as long as the kombucha itself, so those will limit the time you have to store it. Another thing to keep in mind is that flavored, bottled kombucha tends to have more sugar than the plain kind. Some brands add very low-sugar flavors like lemon, lime, or ginger juice which won’t jack up the sugar content, but look out for kinds that are high in added sugar and aggravate health problems. Most people experience great benefits drinking kombucha and have no negative side effects. However, there are possible interactions and side effect symptoms to be aware of, mostly in populations that already have weakened immune systems and digestive problems. Side effects seem to be more of a risk when making homemade kombucha because contamination is possible and the SCOBY disk and finished products both aren’t tested for quality control, like they are when larger manufacturers produce them. If you’re going to brew your own, pay careful attention to using sterile equipment, clean working spaces and high-quality ingredients. 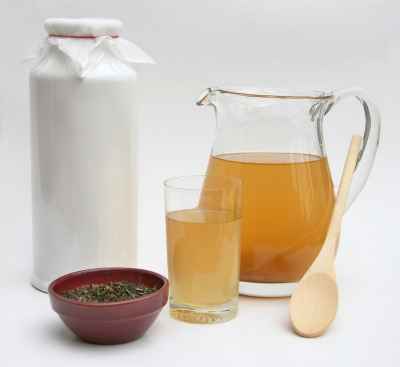 A small percentage of people have experienced stomach upset, infections and allergic reactions when drinking kombucha. Because kombucha has a high level of acidity, it’s possible that this can cause problems for people with digestive problems like stomach ulcers, heartburn, or any sensitivity to very acidic foods. It’s a good idea to start with a small amount in moderation and gradually work your way up to drinking more in order to see if you have any negative reaction to it. Stick to about 8 ounces per day, especially in the beginning. To limit your risk, buy pre-made kombucha that’s been tested for bacterial contamination. People who have compromised immunity due to certain viruses like HIV/AIDS need to be careful about consuming kombucha, since there is always a possibility that the yeast can grow harmful bacteria that can cause illness. This is especially true of homemade kombucha, where contamination is more likely to happen if it’s brewed in an unsanitary environment. While kombucha hasn’t been studied much at all in pregnant women, there is always concern that pregnant women shouldn’t consume alcohol or caffeine, both of which are present in kombucha in small amounts. Before more formal research is conducted showing that it’s completely safe, pregnant women are advised to err on the safe side and avoid kombucha, or at least to enjoy it in small quantities. Kombucha is brewed using black tea and sugar, which when fermented turn into alcohol is very small amounts (only about 1 percent of kombucha is believed to be alcohol). For people with existing diabetes, kombucha likely won’t cause much of a problem considering it’s very low in sugar (about 2 grams per 8 ounce), but it’s worth being careful and monitoring blood sugar levels and related symptoms. For those with digestive problems like IBS or anxiety disorders, the low level of caffeine in kombucha is also something to be conscious of, since caffeine can sometimes aggravate these conditions. As you can see, kombucha boasts many health benefits, and you can even make it yourself for a very low cost so you always have some kombucha within arm’s reach! So drink up for your health! Previous articleEzekiel Bread: Superfood or Gluten Trap?